of a roughly 5km-wide horseshoe-shaped caldera that is open to the south. 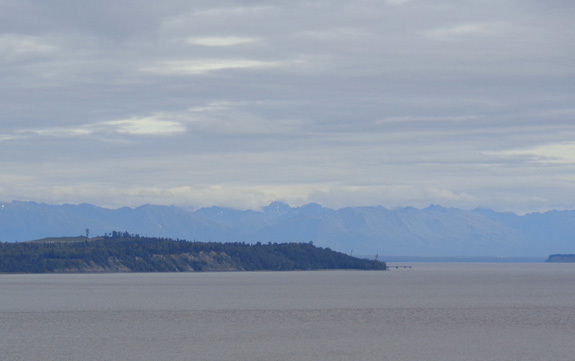 The volcano lies roughly 130 km [about 80 miles] west of Anchorage . . .
That's close enough that when Spurr erupted last in 1992 it deposited some ash on the city. I realize Wiki is not the best source of information so if you're interested in more professional science and history about Mt. 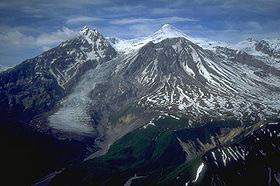 Spurr you can do an internet search or go to this Alaska Volcano Observatory website. I'll talk more about Mt. Spurr in a bit. Yesterday was rainy and gloomy, as predicted, so we didn't go for a website entry-worthy bike ride or hike. We both needed a rest day anyway. We ran errands in the morning and had lunch at House of Bread. Temps remained in the 50s F. at the campground all day, even after the rain stopped about 1 PM. 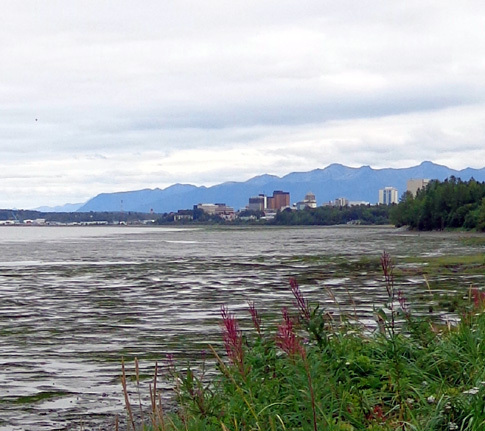 That's chilly for August, even by Anchorage standards. I didn't take any pictures yesterday (Thursday). The ones in this entry are from today. While we were at Sam's Club yesterday we got Cody a new treat called Yummy Chummies. We heard about them on the radio/TV/internet this week: http://www.alaskadispatch.com/article/famous-alaska-salmon-pet-treats-going-nationwide-sams-club. 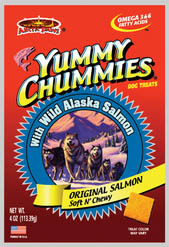 Yummy Chummies are made by a local company, Arctic Paws, that uses discarded salmon parts and makes them into dog treats. 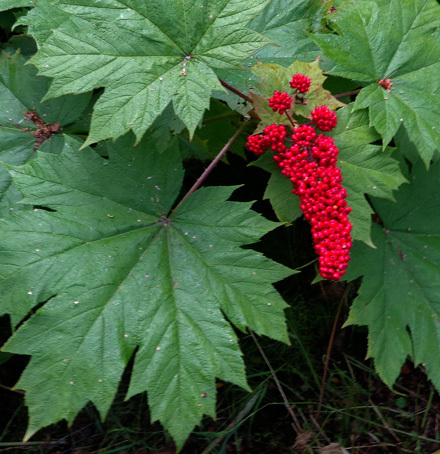 There are several varieties. Sam�s and Costco sell the �gold� version that�s 95% salmon. The news this week is that Sam�s Club is going to start selling them in the Lower 48 states, too. The company has opened a new, smaller processing plant in Arizona to reduce transportation fees to service the demand down there. We joked about the cost of the bag of treats, saying it's wasted money because Cody probably won�t like them. Ha! He's never turned down any food ever offered to him, including a variety of fresh vegetables. He could smell salmon inside the foil bag all the way home and just about took off my hand when I offered him a Chummy after he ate his supper. He'd probably eat the whole bag in one sitting if we let him. He�ll get one after each of his two meals a day and that�s it. The product doesn�t have to be refrigerated but it won�t last as long as dry dog bones (supposed to eat within 45 days of opening the package). I hope we can find it at Sam's Club when we get back down to the Lower 48 because it's cheaper there than online from other merchants. depicts the massive destruction from the epic 1964 earthquake in Southcentral Alaska. By 9 last evening we could see large patches of blue sky. Jim and I took a walk around the campground with Cody and considered going on a bike ride. We didn't have enough daylight left, however. Sunset is now about 9:30 PM, which seems odd after going to bed when it was still light for so many weeks. We are reminded every day that winter is coming to Alaska and we need to consider when to head south. Ironically, we'll be traveling north before we go south. 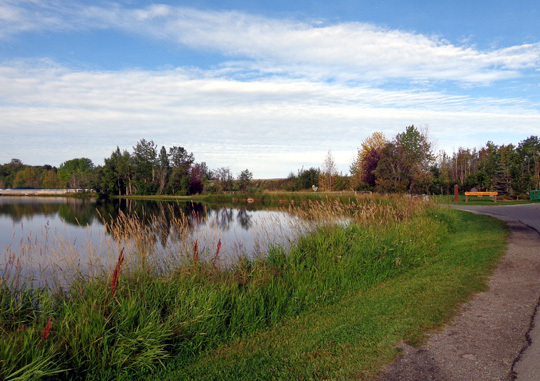 The good weather held long enough this morning for both of us to get in a good bike ride. I was happy to wake up to a lot of sunshine at 7 AM. Because it was more clear overnight the temperature was only 47 F. at our campsite. By noon it was mostly cloudy, with temps in the low 60s F. around town. It was pleasant while we rode our bikes, even when overcast. the Anchorage Bowl (valley) by the time we got done cycling. 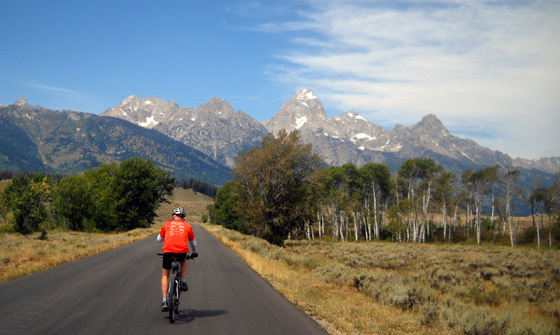 Jim rode to the Coastal Trail from the campground on base again so he could get in more miles. I drove the truck to Westchester Lake and began riding my bike toward Jim. We met up in less than half a mile after I started. I rode another 1+ mile to the northern end of the Coastal Trail and then turned around and met Jim at the truck. He stopped to take off his jacket and get something to eat before we headed south. We rode mostly together to Kincaid Park at the southern end of the trail, stopped for a few minutes for a snack, and rode back to the truck separately. It took me longer because I stopped to take more pictures. Jim went nonstop to the truck and ate a sandwich while waiting for me. There was a lot more sun when I began riding at Westchester Lake this morning. 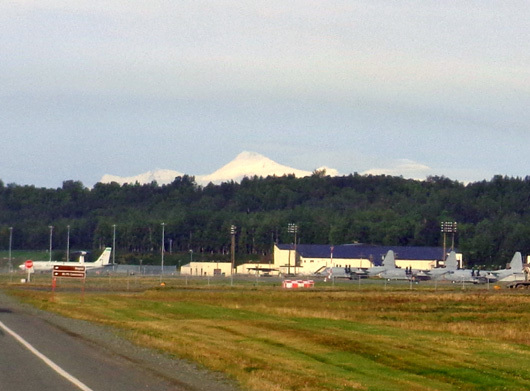 As we were riding/driving west and south out JBER this morning we could see a prominent, pointed, snow-covered peak in the distance that we haven't seen from this perspective before. I knew it wasn�t 21,000+ foot Denali but thought it might be 17,000+ foot Mt. Foraker. All those guesses were wrong. When I got to the spot in the next photo as I was driving through the downtown area I could see the pointy summit was in a long line of mountains, not just one peak. Outbound on the Coastal Trail the volcanic peaks were also more prominent than we�ve usually seen them on previous bike rides. The southern part of the chain (Mts. Iliamna and Redoubt) is to the left. 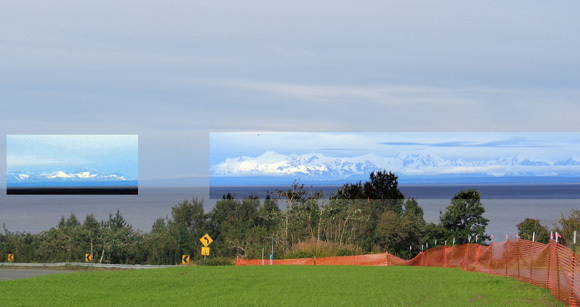 Those mountains probably got more snow this week when it was raining in the Anchorage Bowl. This was a good morning to ride the path. There were some locals and tourists walking and riding but not a lot of them and most everyone was courteous and aware of other people using the trail. 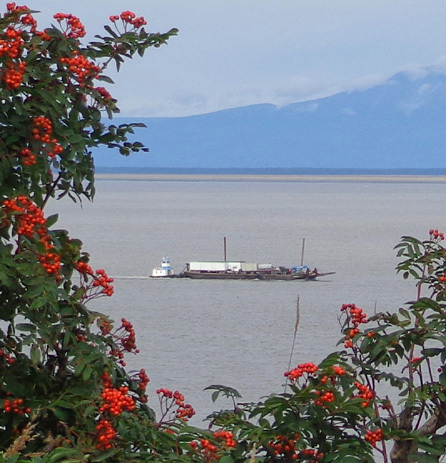 A barge heads through Cook Inlet to the port; Sleeping Woman is in the background. 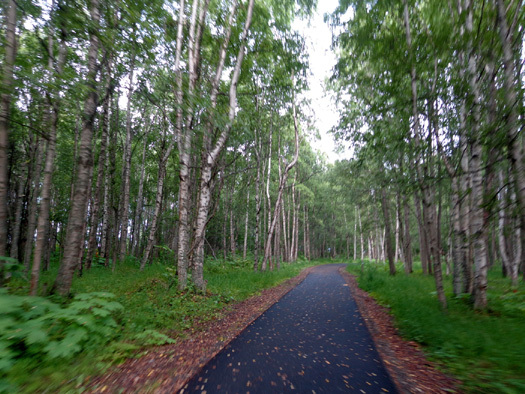 along the Coastal Trail and in the nearby Chugach Mountains. 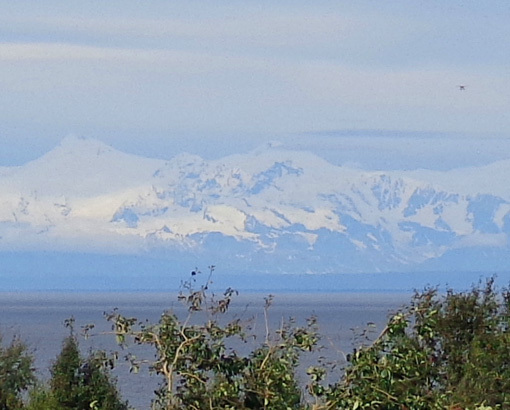 skyline and Chugach Range are in the background. Yarrow flowers are still blooming along the coastline, too. 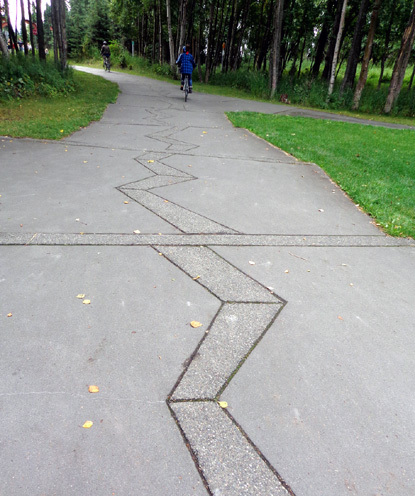 Multi-use paths don't get much smoother than this! Neither of us saw any big critters this time. 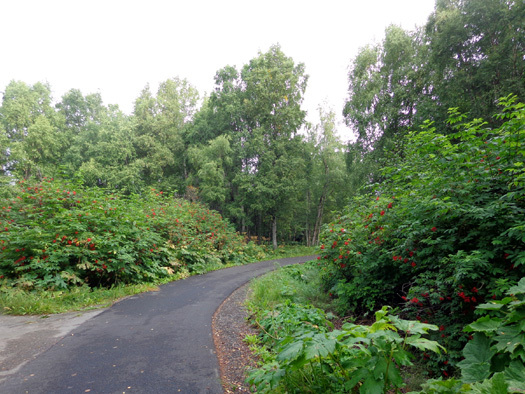 We always have our moose and bear antennae up when riding this bike path because we've seen so many of them along the trail before. 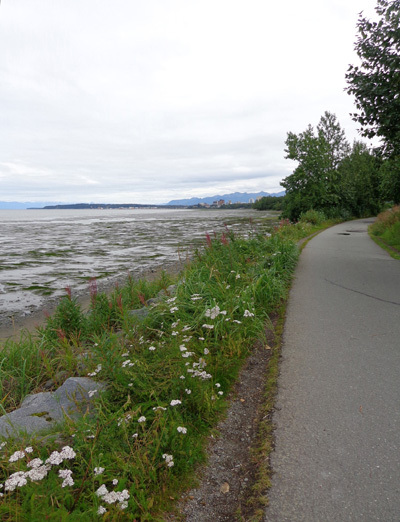 This may be our last time to ride the Coastal Trail this summer so I savored today's ride. I had a total of about 22 miles. Jim did about 32 miles. YAY -- GOIN' BACK TO DENALI NATIONAL PARK!!! We did it. 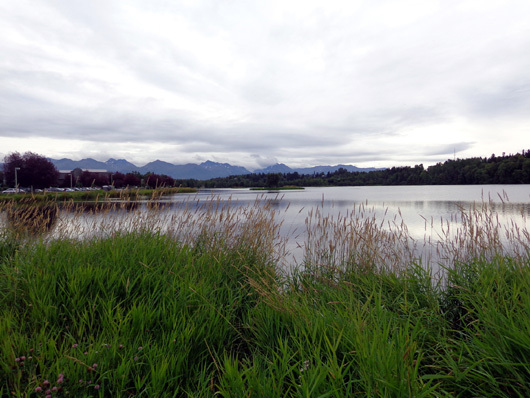 We decided to spend eight more days at Riley Creek Campground at Denali, starting Sunday. That gives us a sure place for the Labor Day weekend. Our plans have morphed all summer in Alaska as we learn about more places we want to visit and return to ones we've really enjoyed. Every day we talk about where to go next, especially as time runs out. Winter weather will be coming soon up here. We pay attention to the weather predictions and other factors that may affect the areas where we want to go. 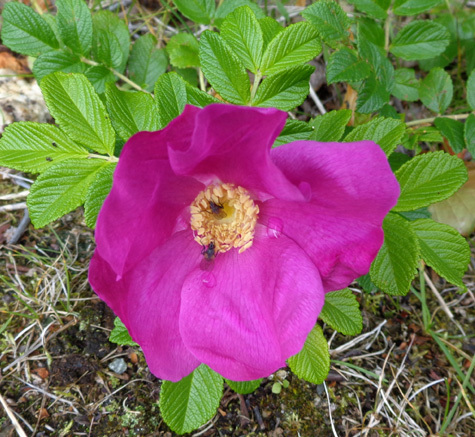 Some of the wild roses are still blooming along the Coastal Tral. 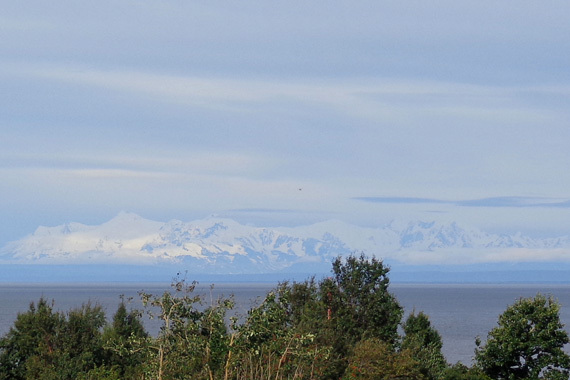 Our recent discussions have centered on whether to remain in Alaska another week or two, or to start heading south. It�s still in the 80s and 90s F. in areas of Montana and South Dakota where we want to stay for a few days or weeks before we travel back to our house in Virginia. That's pretty hot after we've spent most of the summer in chilly parts of Alaska. 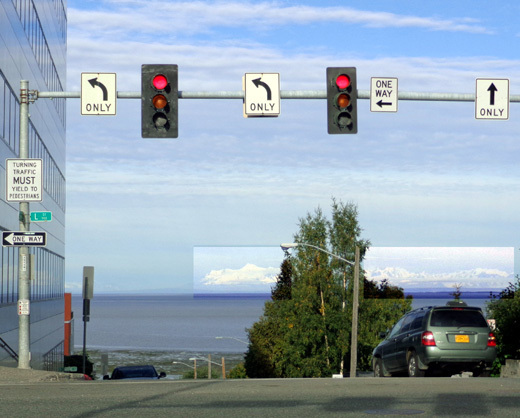 However, we don�t want to stay so long in Alaska or Canada that we get stuck in sub-freezing and/or snowy conditions. We have to cross the Canadian Rockies. We haven't decided which route to take through Canada yet. We're considering going back to Montana via Lake Louise and Banff but that will depend on the weather when we get down that way. 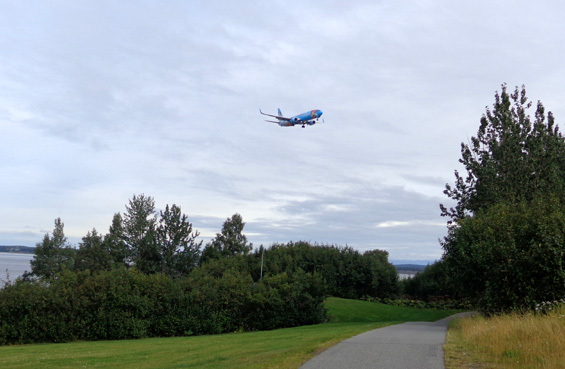 as it aims for a nearby runway at the international airport. 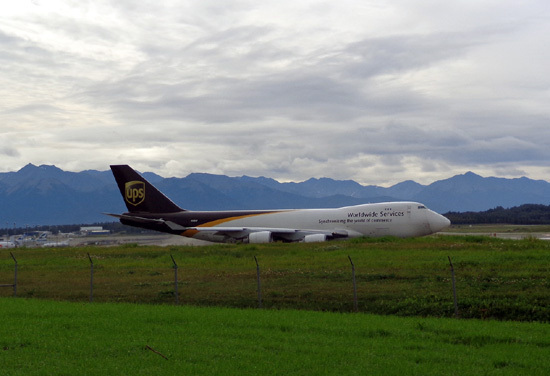 A UPS plane taxies on a runway close to the bike path as it prepares to take off from another runway. Our thoughts keep going back to Denali National Park because we loved it so much the first time we were there. Our original plan back in the spring was to leave the state via Denali and Fairbanks. 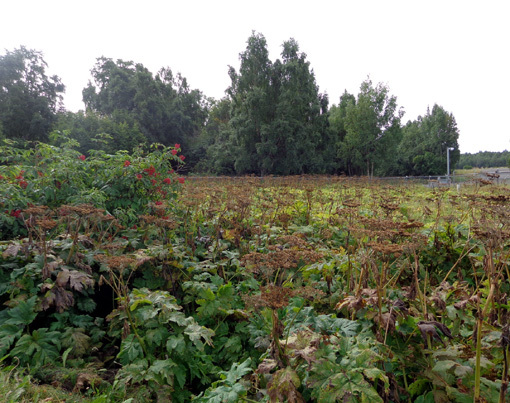 We've hesitated, however, because it's been raining at Denali the past few days, too, and Fairbanks has had air quality advisories due to forest fires south of the city. Since no structures are at risk officials are allowing the fire to burn naturally. Currently next week's weather prediction is pretty good for Denali so our plan reverts to the one we had earlier, with travel to Denali for a over a week, then Fairbanks for a few days, then Delta Junction and Tok to the Alaska Hwy. This way we�ll also be able to say we drove the entire Alaska Hwy. We missed the part from Tok to Fairbanks when we came into the state and went south to Valdez. 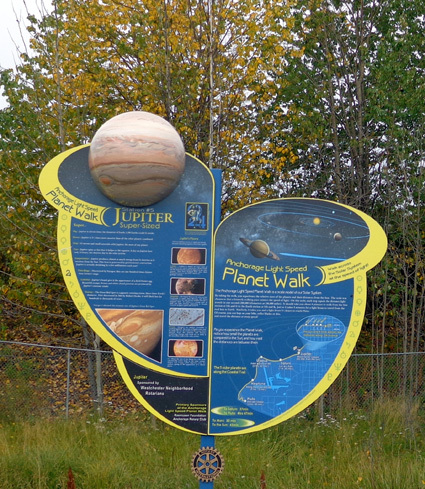 proportionately along the trail as they are in space. It's fun for curious "kids" of all ages. We�ll decide how long to stay in Fairbanks when we get there. It depends on how much smoke (if any) is still there from the fire south of town, the weather, how much we like the Ft. Wainwright campground, how many interesting things we find to do, and our travel whims. Folks are beginning to see the northern lights in the interior of Alaska. 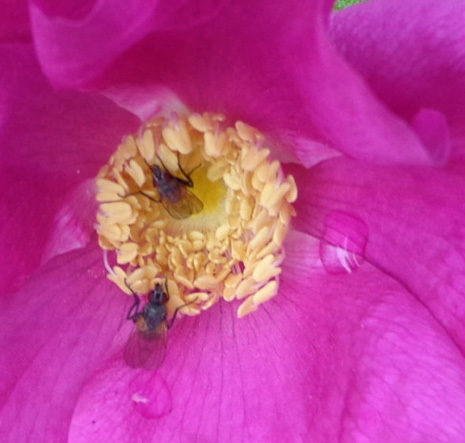 I�m hoping we can see them on a clear night when we�re up at Denali or Fairbanks. That's probably more likely than spotting Jupiter in space! So much to see and do in Alaska . . . Even three months isn't nearly enough time for us.